You must bid (comment below pic) higher than the Starting Bid. Bids must be in whole MYRs, e.g. RM1, RM2, RM3, RM4, RM5, and etc. You are not allowed to bid in cents. Tag the previous bidder, out of courtesy. You wouldn't like to be outbid without knowing anything, right? ;) Do be courteous. Set your limits. It can be exciting when you start bidding. Yet, know when to stop if you can't be sure to pay up. No one likes a backout, especially later when the bids end. 1st Bidder/Comment started with RM55. 2nd Bidder below outbid 1st with RM60 AND tagged the 1st. The bids went on until the cut off time, where by @makersmalaysiacharity announced, "The auction is now over!". 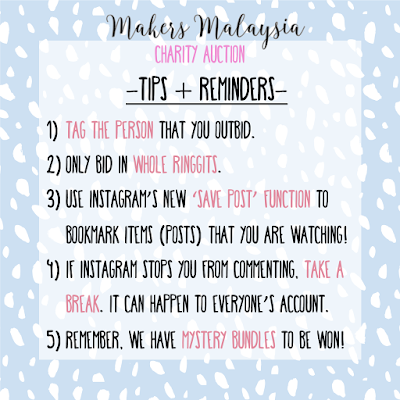 Total all your bids and prepare the amount as @makersmalaysiacharity will DM the bank details. Once payment confirmed, the respective sponsors will contact you for delivery address. Finally, wait for the arrival of your items! Easy, right! 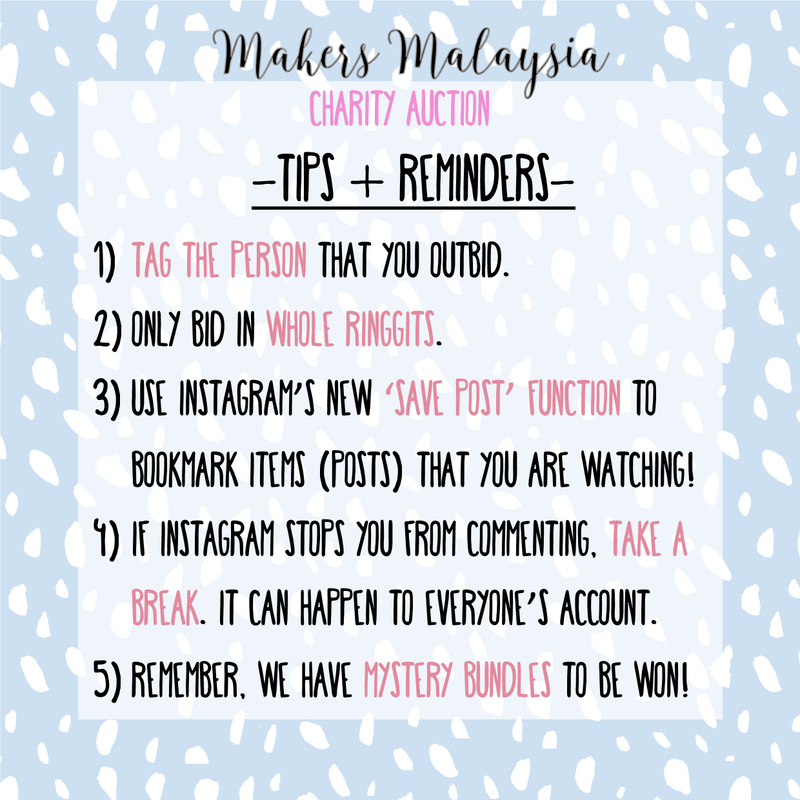 So, go ahead to their IG @makersmalaysiacharity and use the IG "Save Post" function to bookmark your desired auction items! Hold on before you leave my post! @makersmalaysiacharity has something new this time. 2 Mystery Bundles containing various items from the sponsors, from discount vouchers to custom goods as well as other handmade products, worth more than RM600! 1st Bundle: Instastory post. Random pick. Multiple entries on Instastory are allowed, one entry per day! 2nd Bundle: Highest Total Bidder at the end of the auction. Both will only end 10pm 10/9/17! Awww... wish Sha could go for her treatment soon. Support! Support! Oh dear, I did not know about Sha or the auctions or the reason behind the auctions. Indeed, where have I been? Thanks for sharing the information. Will check out the auctions. Didn't know about Sha and the auctions. Hope Sha can go for treatment soon. Wish Sha the best. Hope she is on the road to recovery. Thanks for organising the auction. It's a very worthy cause. I commend you for your kindness. I think that this is a very innovative way to use social media for good. All the best to you and your endeavour too. Thank you. 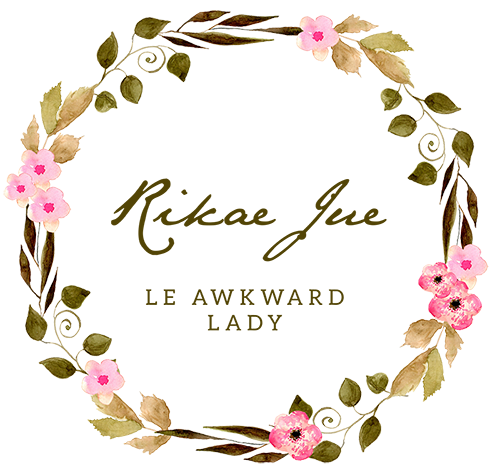 You have done a good job Rika. I will share this out. Good job for this charity auction. I hope sha will recover soon.